Sleep is for the weak, Arigato Event is for World Campus – Japan! If you thought that World Campus – Japan is the kind of program that would make you feel rested, well you’re very, very far from the reality. The previous day, I went to sleep at 2:30 am, because I had to write a letter to my host family and didn’t have time before. My host family invited two other host families in the evening (so there were 8 little kids running around in the house, which might sound very cute, but is at the same time very tiring). So the morning, with my eyes half opened, we had our first Naginata practice! Even as a half Japanese, I had no idea how this sport was done. We practiced it in a tiny room with 25 people in it doing some Naginata moves. It was actually very fun, even if I almost made a hole in the wall. I enjoyed it much more than the Kendo we tried in the previous week. Later, we tried Taiko. I usually love it, but today the song was a bit repetitive, so we decided that it was much better to dance Bon-Odori all together instead. 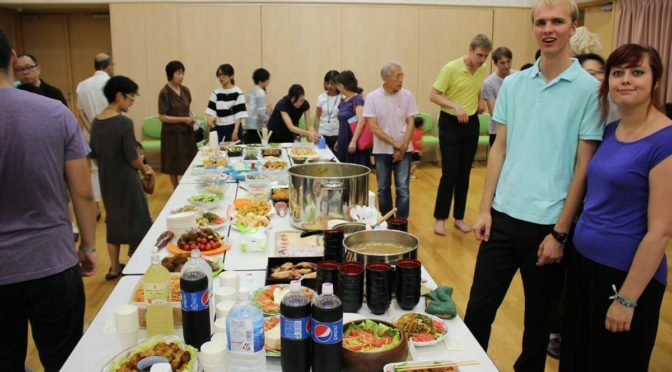 Here is the World Campus – Japan mentality: “If we find a way to dance and make fool of ourselves, we’ll probably do it.” I guess that Arigato event is a perfect example to illustrate that. Anyways, it was much more fun dancing traditional Japanese dance with Japanese people around, all wondering what kind of weird gaijin we were. After eating our lunch, which consisted of onigiris and soup, we had an exciting meeting about the next city, with our beloved city runner Jürrien – yayyy! Later we started practicing for our Arigato event. I decided to step out of my comfort zone and take a clever risk (just as Hiro-sama always says) by standing in the front row for the dance. I have to admit that even if my dancing skills are as bad as most of the participants, the dance of the Arigato event is probably one of the best part of the whole trip (as much as being thrown away by Juuso when he gets a bit excited). During our Arigato event, I saw my host mum crying. This is the kind of thing that makes you feel very proud of yourself, and which makes World Campus – Japan such a great program. Even if it’s just one week, the people are accepting you as a member of their family. Creating bonds with different people from different age is very rewarding. But guess what? Tomorrow for our host family day, we’ll wake up at 4 am to go to Tsukiji fish market. Don’t get me wrong though, I am very excited, but am I ever gonna have a normal amount of sleep one night during this program? Previous PostPersonal day in Mito: Being a member of the familyNext PostNatural disasters and fireworks; what a perfect host family day!